For more tips follow me on twitter @PhatLewtsGold! My contact email is PhatLewtsGold@Gmail.com. DISCLAIMER: The data collected was for my own personal use and the conclusions I draw obviously do not apply to EVERY server. Now that I got that out of the way, data was collected on both my main (small/med) server Horde + Alliance, as well as Lightbringer Alliance. 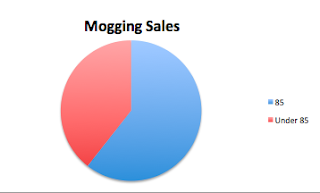 The main thing I was looking for is the answer to this question "Who is buying transmog gear?" Of the levelers buying the gear I was selling for transmog, about half of my sales were to characters under level 85 were actually using it for mogging, not as their gear. 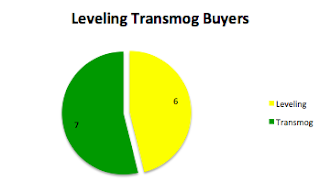 The way I defined "using it for transmog" was if someone was buying a piece of gear under their prefered gear range by 20 levels or more, and/or had transmoged it. I was surprised to see that people had actually purchased transmog gear for their levelers...for just transmogging! The ranges on the 85's were from 300-5,000 gold, and the ranges on the levelers were from 50g (a mispost, but I included it anyway) - 2,500 g. Other than one toon that was level 84 and bought two pieces for xmog for 2,500, the leveling average was around 472g. The level range of those under 85 was from 18-84. Every leveler that bought it for mogging was level 70 or higher. I think I would see more lowbies mogging if I keep (and I'm going to) collecting data. I like to mogg my BoAs for shits and giggles in BGs, so I know at least I personally would keep this market healthy! I was surprised so many of my sales were to leveling characters, and that so many of those leveling characters were enthusiastic enough to mog their gear before hitting 85. This week I got back into my crafting groove, as can be seen from my recent posts. I made lots of gold, and I'm back up to a comfortable amount this week, 10k over 1 million. Going to aim for 1.1 million by the end of next week, but we'll see how that goes. Been doing the shuffle, got 400 stacks of ore waiting for me, but they will have to wait, my WoWing and this blog will be on hiatus until Wednesday. Other than that I've been posting just about every thought that comes to my mind on my blog this week, so not much else to say. I'm going to work on finding or creating a great TSM and Auctionator comprehensive weapon mogging list. Lately I've been using 2 different auctionator lists. One was created by Ruls, and the other was created by Alto. Check out the links if you're interested in trying them! I'm looking for maybe a happy medium between the two with some choices that are on neither. I am leaning towards a preference towards TSM on the weapon mogging list, simply because I think there will be more than 50 weapons I'd search for, I'm thinking 75-100. FYI if you want to try Alto's weapon lists, you can compact them all into 1. Keep an eye out for my new lists, I also want to try and compile everything I'm currently using into one post in the near future for the convenience of the newer readers of my blog, so they don't have to hunt it down :-P. Maybe I should just label things better! Also, if you haven't noticed there's a new tab for my weekly reviews if you care to read the past ones! I mog my heirlooms on leveling alts so I don't have to look the same for 80 levels. In your weapon list, make sure you list the Hanzo Sword. I have yet to see one of those fail to sell, at 750G on my server.